For individuals and families who are looking for a fresh perspective on their health and solutions that fit their lives. At Robin’s Nest Family Care we consider our team family and we want to extend that same feeling to you. Our practitioners have decades of healthcare experience and work together to help heal you faster. We provide our patients with the information to empower them to take control of their health. We work collaboratively all under one roof, saving you time and reducing your stress. Our goal is to inspire people to see that within every challenge, setback, or new life stage is an opportunity. The opportunity to feel better, to live more fully, and to uncover your best self. At Robin’s Nest Family Care we believe our work is complementary to all other providers. By working together we can help individuals and families heal faster and stay healthier longer. Robin’s Nest Family Care is devoted to helping families achieve and maintain excellent health. 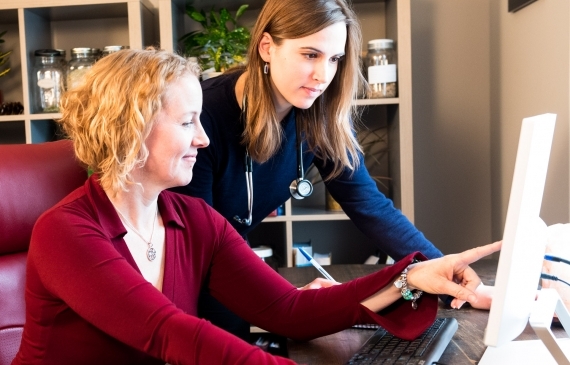 Utilizing a philosophy of treating the root cause of the health concern(s), not simply the symptom(s), our team based approach helps restore your health with greater efficiency. Our approach is to work collaboratively with our patients, to empower and inform them of the treatment options and the possibilities. We are offering to provide a “fresh perspective” about your health concerns and help to figure out what treatment plan works best for you to fit your busy lifestyle. We prioritize our patients by taking the time to listen (full hour appointments), adapting to their needs (personalized treatment plans), and creating an atmosphere of understanding and acceptance. Ultimately providing connection and guidance to help maximize your quality of life. Robins Nest Family Care is an incredible full service family care concept and vision with the most wonderful, caring and talented practitioners. Not only do the practitioners understand whole body healing naturally and effectively, they’re truly aware of the connection between mind, body and soul and optimal health.